United States is the home to the busiest airport in the world; Georgia’s Hartfield-Jackson International Airport (ATL) in 2014 took the title for the 17th consecutive time with more than 96 million passengers who boarded and deplaned. In 2013, there were 9,734,073 registered carrier departures in the United States; over triple the number of the second placed country. For the purpose of this course work, I will be illustrating the flight pattern for the 7 days of the week concentrating on the 10 busiest US airports as reported by the FAA in 2014. JFlowMap; a dynamic and interactive Java application will be used to visually explore the temporal pattern of the flow magnitudes displayed between the origin and destination maps illustrated by a heatmap. 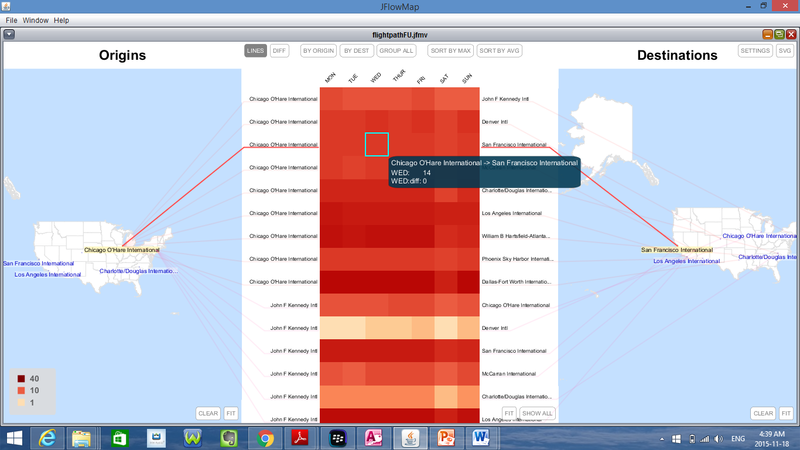 The heatmap will allow users to explore the whole data in every bit of detail. Performing spatial visual queries and focusing on different airports of interest by hovering over the heatmap, informed decision on the days that these airports have less air traffic will be known. The 10 busiest airports had 9,588 flights for the period of 14th – 20th January 2008. Firstly, clean up 2008 airline data downloaded; filter data in Microsoft Access to obtain study period and airports of interest. Create all files needed to run the JFlowMap; node.csv and flow.csv files containing the data, a shapefile with US state boundary map and a configuration .jfmv file. Hope you find this geovisualization tool interesting! Feel free to leave comments and suggestions. To download JFlowMap for desktop click here. For data source used click here. Fast facts about the world’s busiest airports. Retrieved here.